FEEL THE RUSH OF THE ESCAPE & THE THRILL OF THE TAKEDOWN! Outrun the law in supercars like the Pagani Zonda – or stop racers cold in high-speed police interceptors like the Lamborghini Reventon. Plus, you can challenge a friend to a head-to-head Cop vs. Racer showdown via local WiFi or Bluetooth. Made to maximize the Retina Display, the eye-popping visual quality will put your senses into overdrive! Focus on the chase with the intense HD-quality clarity of the Retina Display. Burn through coastal, desert, and mountain environments in night, day, and dusk scenarios. Experience epic takedowns and awesomely over-the-top crashes. 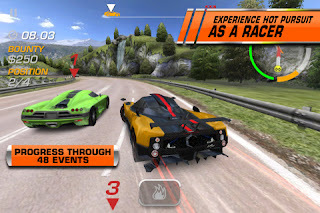 ** DOWNLOAD THE NEW UPDATE AND BE THE RACER! 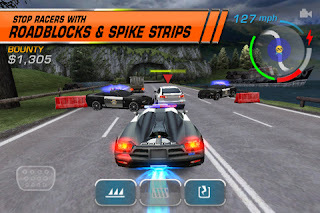 ** Feel the rush of the escape and race against the Cop with the all-new RACER CAREER MODE. You wanted it! You got it! Thanks for helping make Need for Speed Hot Pursuit the hottest racing game on the App Store. Now get ready to RACE like never before!